Are you a transit operator ready to join the fuel cell revolution? If so, you're in good company. As British Transport Minister John Hayes recently said, “the transition to zero emission road transport is both inevitable and desirable, as it will improve air quality in many of our towns and cities". If you are looking to expand your fleet with hydrogen-powered buses, one of the main things to think about is hydrogen refuelling infrastructure. And as more transit agencies adopt hydrogen technology, the demand for large-scale refuelling infrastructure will only increase. Although there have been great developments in fuel cell buses in recent years, it's important to know the refuelling infrastructure hasn't caught up yet. There is a big knowledge gap around designs, processes, and safety when it comes to this technology. 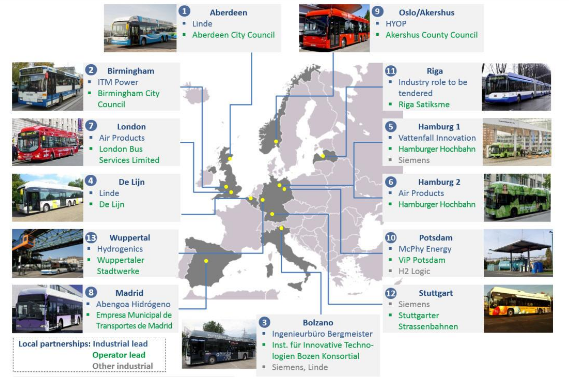 To address this gap, the Fuel Cells and Hydrogen Joint Undertaking (FCH JU) have written a comprehensive report called New Bus Refuelling for European Hydrogen Bus Depots. The purpose of the NewBusFuel project is to provide guidance based on real-world studies of fuel cell buses in transit. The report is a valuable resource for anyone thinking about transitioning to hydrogen-powered transit. For their study, the FCH JU worked with European countries who are already using hydrogen buses. Studies were conducted at twelve different sites in seven European countries. Notably, the report includes a case study on the Aberdeen Bus Hydrogen Fuelling Station, which is the largest fleet in Europe to date. In each location, joint teams of bus operators and industrial hydrogen refuelling station (HRS) experts produced the studies. In them, they addressed challenges around the logistics of large-scale hydrogen refueling stations. The goal was to provide fuel to a fleet of 40 to 260 fuel cell buses. Building and operating hydrogen refuelling stations that fuel hundreds of fuel cell buses. Currently, maximum fuelling capacities are for up to fifteen buses. Designing new business concepts, leading to more competitive fuel prices. Limiting the footprint by increasing storage pressure, as well as fitting refuelling units in busy urban bus depots. Other challenges around technical, as well as stakeholder issues, were also addressed in detail. The NewBusFuel report is a great resource for any transit operator considering fuel cell electric buses. We are at an exciting time in the development of hydrogen technology, and the report is the first of its kind to provide such in-depth case studies on the topic. The report shows that hydrogen refuelling infrastructure is scalable and that the hydrogen price target of €4-6/kg of H2 could be reached. The technology exists today to build hydrogen fueling stations for 40 or 120 buses with on-site production. Alternatively, hydrogen could be delivered to the bus depot and the buses can be refuelled within the current operation schedule. The NewBusFuel study will provide guidance to anyone needing to learn about large-scale refuelling infrastructure, and how to apply it to real world situations. For more information on hydrogen refuelling infrastructure for European fleets, download our white paper below. What challenges have you faced in the implementation of hydrogen fuelling stations? Let us know in the comments. Download our free white paper to learn about flexible fuelling solutions for European transit operators.